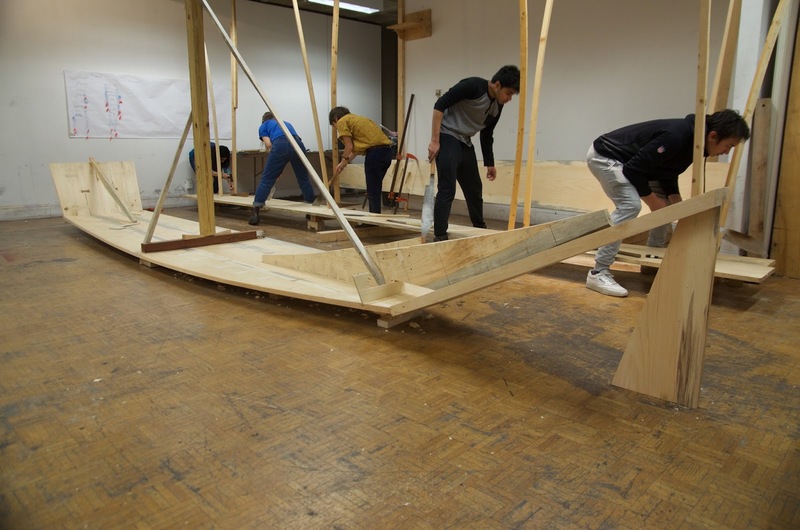 We are three-quarters of the way through our class, now committed to building two Japanese boats: one is the 21-foot Hozu River boat and the other is based on a rice field boat from Niigata. For the latter I am scaling it down slightly working from a photograph of the original. 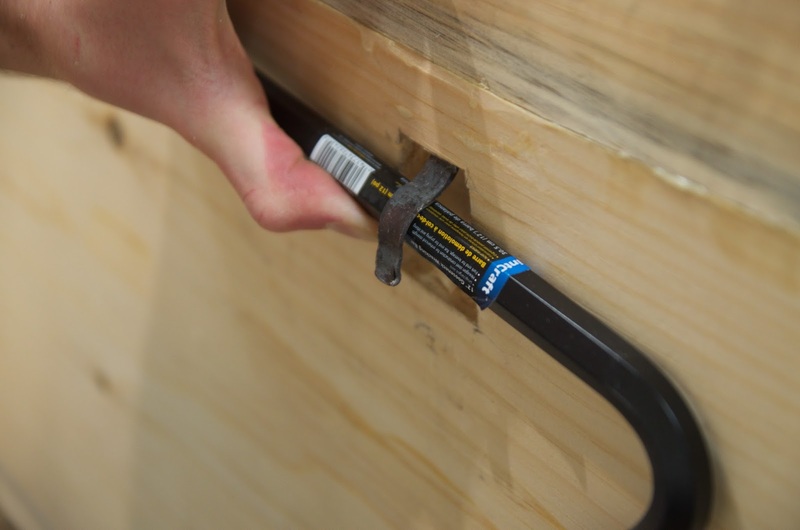 We don't have time to scarf our material into longer lengths, hence the shortened version. 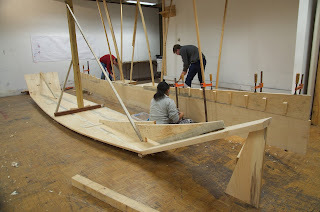 A look at the bottom of our boat. Our planking material is sixteen-feet long, so we have to scarf together and make longer lengths. Note the traditional scarf joint which is edge-nailed. 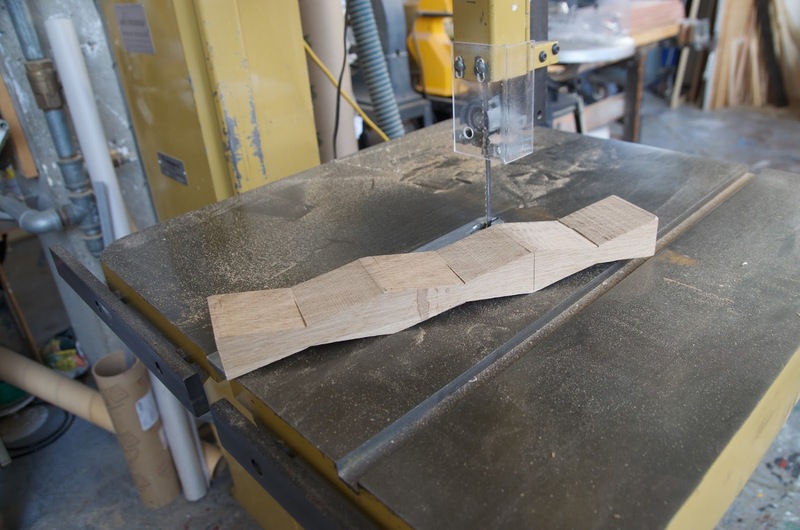 Students then start saw fitting small pieces at either end of our long plank to give it enough width at the ends. 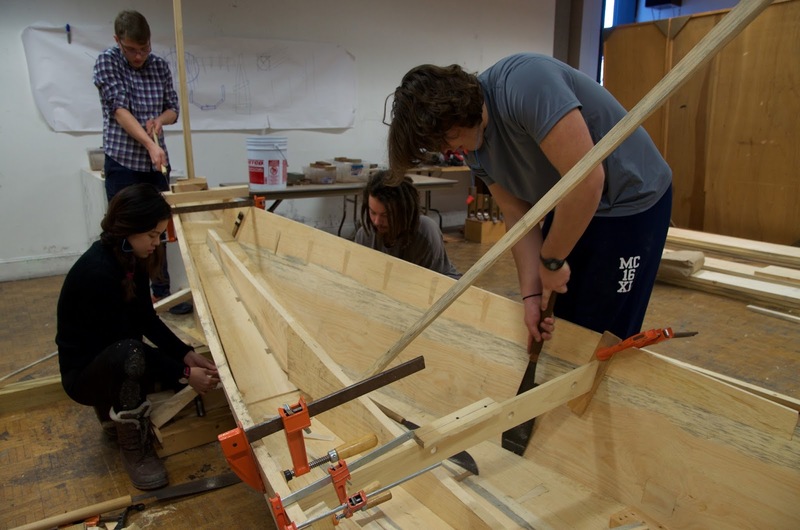 Meanwhile, we've assembled the bow, bottom and transom, held together with props, and bent the bottom using the large post amidships. 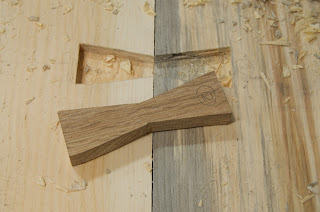 Cutting nail mortises for the side planks. 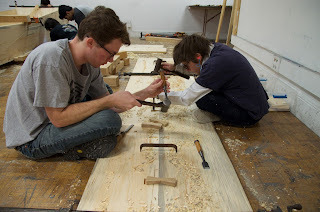 Nailing the side planks together. 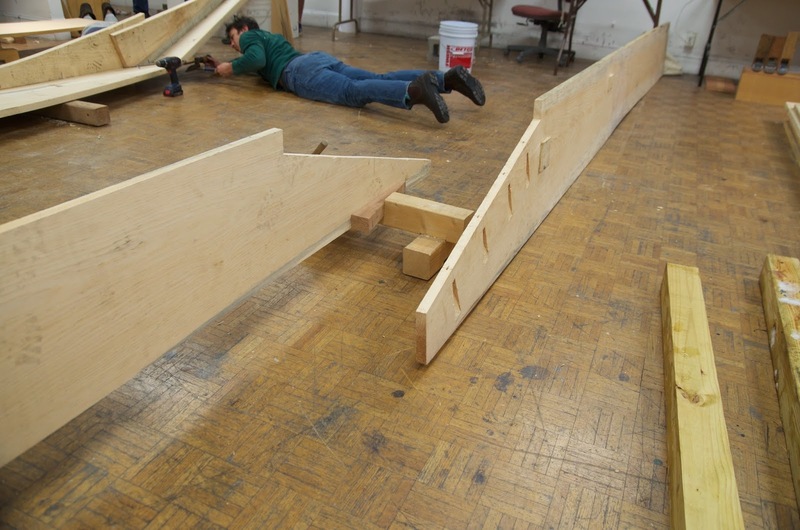 You can see the side plank and if you click on the photo to enlarge it and look closely you can count four pieces total. 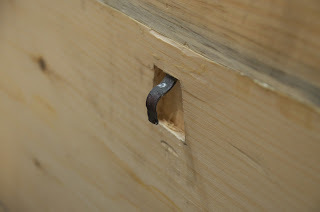 Three nails came through the back of the planking. 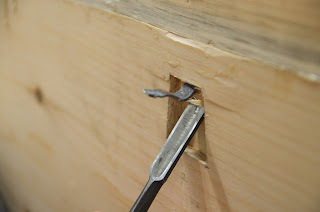 One we were able to tap back out and re-insert properly; one we just couldn't seem to get to work so we abandoned; and this one we decided to do a traditional fix by bending the tip back and mortising under the nail. 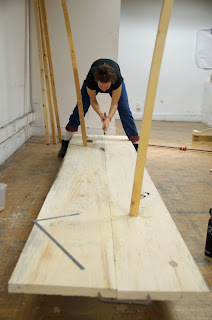 ...and pounded back into the plank like a clench nail. A plug fills the mortise. 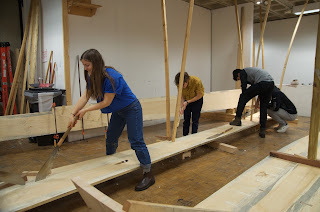 Bending the side planks on the boat. 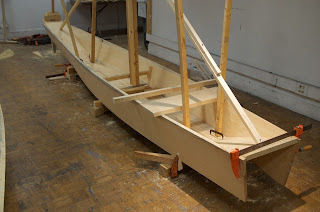 I like teaching these river boats because most feature wide bows, thereby making the bending much easier. 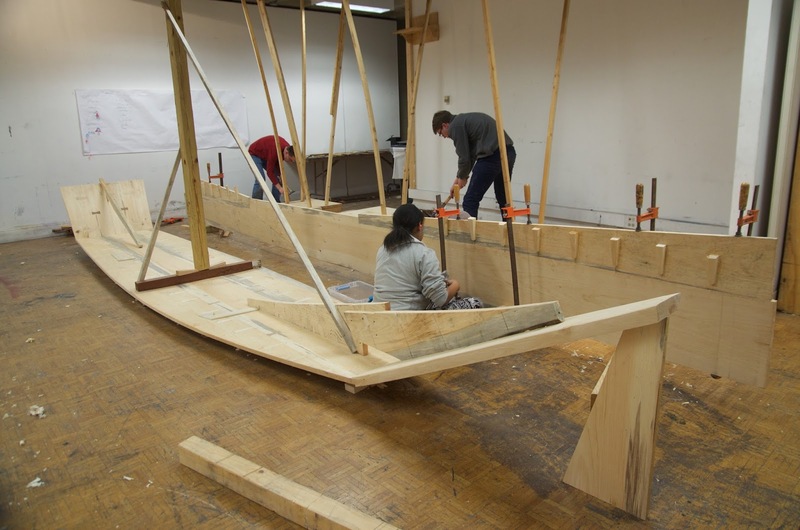 In sea boats planking has to be bent over an open fire, something that is difficult to accommodate in the classroom. 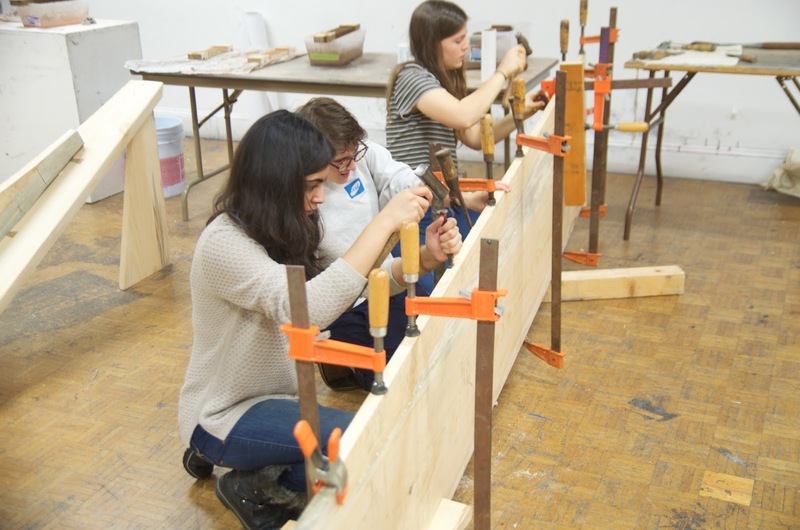 Students beginning to fit the side planks using handsaws. This may be the most difficult technique in Japanese boatbuilding, since you are working around a curve and its VERY easy to start sawing into the planking or bottom. It is also surprisingly easy to not notice you are doing this (often its only visible from underneath). 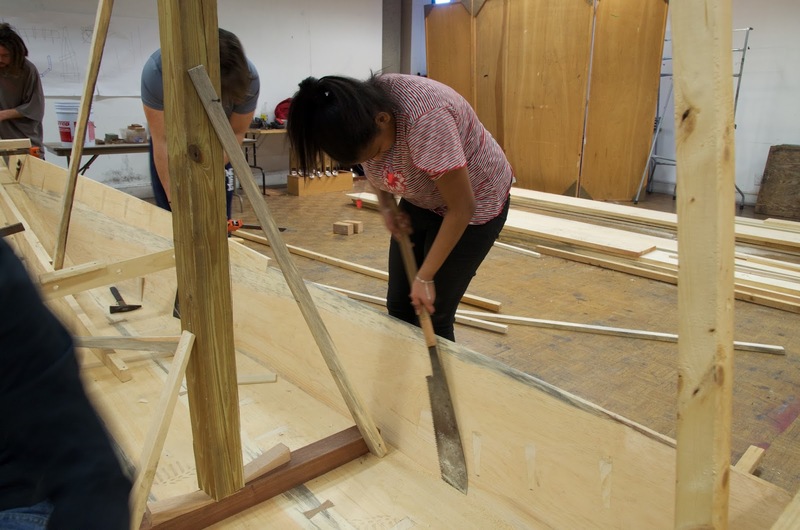 I tried to reassure my students that cutting into the plank is a mistake I've made, as well as my teachers. One of my teachers made me lay on the floor over a period of several days and just watch the tip of his saw and warn him if it wandered out of the seam. 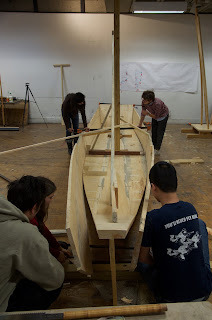 My class convinced me to let them build a second boat, so a student got started fitting the bottom planks. 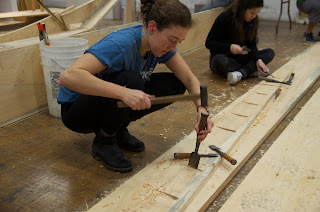 Note she was using a kasugai, or staple set in the end grain to clamp the planks together. 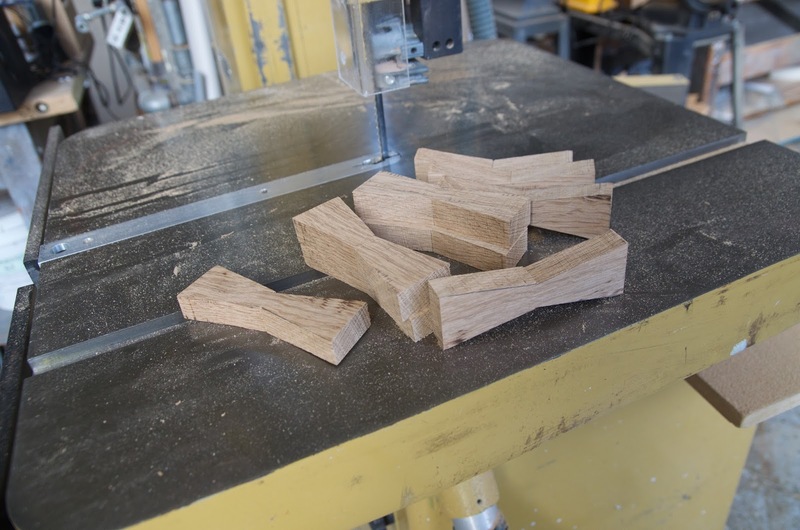 Meanwhile I was cutting our fastenings for the second boat, oak dovetail keys. Students chiseling mortises for the keys. These fastenings have various names throughout Japan, but in the Niigata region where this boat comes from they are called chigiri. 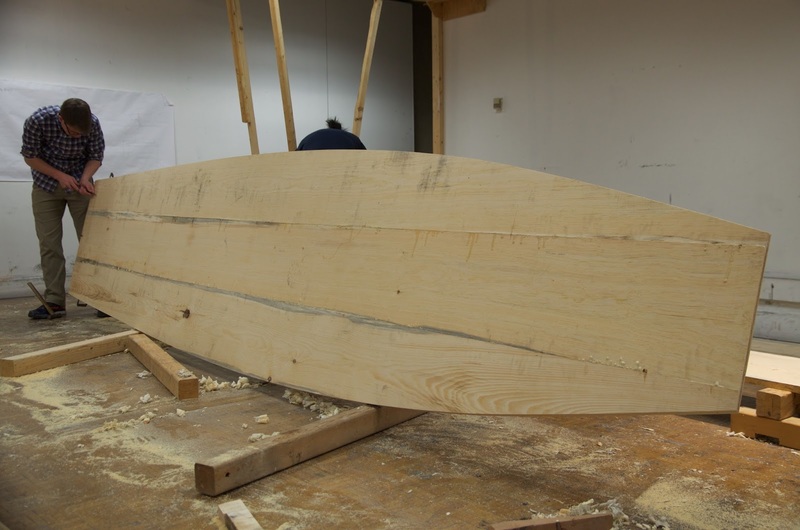 Here is the backbone for the smaller boat. Its based on a photograph of a tabune, or rice field boat from Niigata. Locally these are called itaawase, which means "plank built." My slightly scaled-down version was designed so our 16-foot long planks could work without scarfing. I think its going to be a very pretty little canoe-like boat. 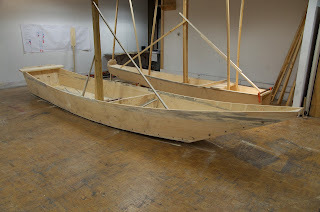 Here is our bigger boat, with the small one in the background. 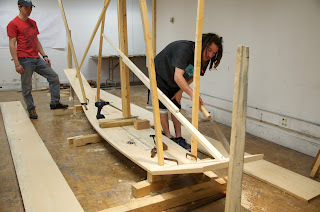 We are three weeks in, with just one week to go until launching. It is an impressive progress on this project! Do you start each day by instructing them all in what they should be doing, and then everyone does so in silence, or do you give instructions spread out during the day? Also, does the university have all the tools needed, or are you supplying the Japanese tools? All in all it looks like a fantastic project. I start the day with as limited amount of instruction as possible, then we work together in silence. 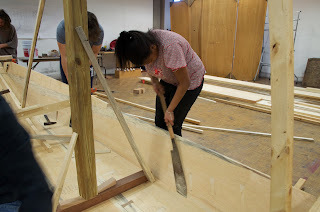 The boats are being built entirely with my Japanese hand tools. I have only my circular saw for some operations. I failed to completely answer the first comment. The students are using my collection of Japanese boatbuilding tools. 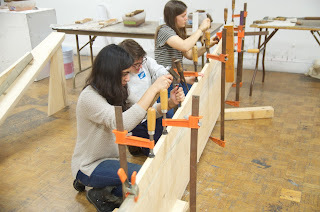 The College has a small woodworking studio but we don't rely on it.